Last week a Fortune article by Editor Shawn Tully, suggested an American VAT is the inevitable fix to the deficit. Article here. He quotes White House budget chief Peter Orszag, who confirmed that it is seriously considered by policy makers. What this means to you, and any business that manufactures, distributes, or sells a product in the United States; new compliance to complex electronic supply chain documents. The VAT electronic documents are called many things internationally but most commonly referred to as e-Invoices. The GTBP interviewed industry expert, Jason Bruce Jones, VP of Crossgate Inc, to find out what might be in store and how painful implementation will be for businesses. VAT is a consumption tax, and a regressive tax, which is ultimately paid by the consumer, but it is collected from businesses in every movement of the product. There exists a VAT in just about every civilized country except the United States. VAT is one of the biggest tax revenue generators, and for the U.S. who wants to continue spending, it's one of the only possible answers for the deficit. As Nancy Pelosi stated on PBS's Charlie Rose back in October, VAT is "on the table". Jason Bruce Jones, VP of Professional Services at Crossgate Inc, has been responsible for VAT e-Invoicing initiative in 38 countries over the last 7 years. His company, Crossgate Inc, is partly owned by SAP AG, and has helped thousands of companies meet international compliance in an integrated e-Invoicing model with their ERP system (mainly SAP). GTBP: Jason, how complex is VAT e-Invoicing for a company that might already be familiar with EDI (electronic data interchange) transactions with major customers? It's a different ball of wax. Each country has its own unique standards that vary widely in data formats, communication requirements, and flow of transactions. Let's use Brazil as an example. Brazil's model is the most advanced and considered the future of VAT e-Invoicing. Other countries, including Mexico and some in the EU, like the new EMCS (Excise Movement and Control System) for tobacco and liquor, are moving to the Brazilian model. Brazil's VAT e-Invoicing initiative is called Nota Fiscal Electronica (NF-e). Compliance is mandated to be in place by this April. The transactions' formats are XML based documents, which are traded and stamped approved by the Brazilian government (SEFAZ) in a real-time environment (approval delay counted in seconds). A company cannot ship goods until they send and get approval back from the government on their digitally signed, legally obligated, XML customer invoice. The invoice gets printed out and attached with the bill of ladings to the shipment. If that shipment is checked by the government, the officer checking the shipment will scan the barcode (protocol number) to check if the shipment is valid in the SEFAZ database. When the buying organization receives the goods and invoice electronically they must also verify acceptance of the invoice with the SEFAZ, which they are now legally obligated that the invoice is correct. GTBP: Can you give us a simple example? A lumber company sells $10 worth of lumber to a furniture company. The lumber company pays VAT on the $10. The furniture company sells the furniture to a wholesale distributor for $100. The furniture company pays tax on the net ‘value add' $90. The wholesaler sells the furniture to a retailer and pays tax on their net over the $100. The government wants to see the legally signed XML customer's invoice that is accepted by both sides so that companies cannot cheat on the VAT. Therefore every single invoice and movement of goods, from either inside or outside the country, needs to be approved by the government before shipment. Government auditors have a quota and mine the database to fine companies for non-compliance. 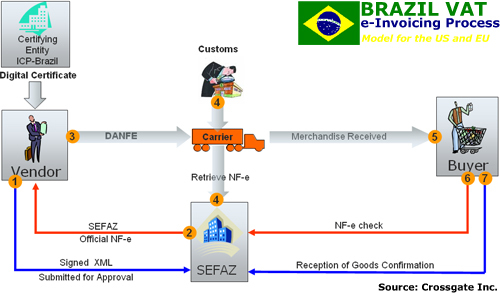 VAT countries are moving to this Brazilian NF-e model. GTBP: How are you helping customers comply with the VAT e-Invoice mandates today? Imagine a large multi-national company like GM, Brown-Forman, and Kellogg's, who have a centralized ERP system, like SAP, which they need to now convert their invoice, and meet the requirements of, let's say, 35 different countries. Each region has different standards, data formats, signature, integrity, authentication, archiving, and communication requirements, processes, summary reports, and legal obligations to the accuracy of that invoice. Some of the data might not even exist in an existing IDOC. None of our customers want to setup and maintain 35 different countries requirements, many of which are in a constant flux of change. They see a lot of value in a single, ERP integrated, connection to the Crossgate Platform to outsource these complex processes to professionals who are in the business of international e-Invoice compliance. GTBP: It sounds like the SaaS (software as a service) model for outsourcing is the way most companies will go for VAT e-Invoicing compliance. Can you give us an idea of the average or median costs per invoice for an outsourced e-Invoice compliant solution? Costs depend on many factors including integration, transaction volume, and level of outsourced services. But for an industry metric, I would say just under $1.00. If the company was previously transacting paper invoices, which the industry cost average for postage, paper and handling is $5, then the upgrade to the VAT mandate actually saved the company $4 per invoice. If the company was already transacting the invoice via EDI with the customer, it might be a slight marginal increase per transaction since it is additional outsourced services unique to the EDI processes. But with the falling costs of technology services, companies might be able to negotiate e-Invoicing services bundled in with a new outsourced EDI contract for less then they are paying today. GTBP: Thank you Jason. We look forward to hearing from you again here on the Global Trade Best Practices Organization. There are many resources, including Wikipedia that have additional information on VAT and e-Invoicing. Over 80 countries have a VAT, and since it is such an enormous tax revenue generator, it's understandable how most countries will want the most complex system to track and authorize every transaction. It appears that the democrats are not just shaking down the wealthy for tax revenue. A VAT consumption tax will most negatively affect the poor. It looks like the free healthcare for the poor is not free after all. The poor will just have to eat less, which should bring down the type 2 diabetic rate and lower the nation's healthcare bill to boot. Yeah right. To businesses: this might be a good time to begin investigating outsourcing electronic business transactions, EDI, XML, e-Invoicing, to a company that is positioned to take on the new US VAT requirements. Overall, in a bundled service agreement, it might still be more efficient than your current processes. To B2B EC providers, you better get prepared with an e-Invoicing story to sell. This will most likely be the next big boom for the industry. To the US Government: Bring_it_on. We need a sustainable future for our retirement and our children's future. Enforce a VAT tax, slightly increase top end income tax, capital gains, and turn the estate taxes back on. And at the same time, CUT EXPENDITURES, moderate free trade with protectionism. Please find the moxie to implement the tough long term decision to make our country and children competitive. Do it now while we have the leverage as the world's largest buyer.